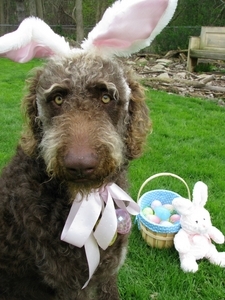 Posted on Wed, Apr 11, 2012 : 5:54 a.m.
Fozzie as the Easter Bunny. Cute, eh? April has been kind to us here in the Ann Arbor area lately, and we humans aren't the only ones getting to take advantage of the weather — companion animals get in on the action, too!